Just when I think I’ve got a handle on The 100, the show does something insanely unexpected and I’m left trying to figure out how we ended up here. Let’s talk through it all. Clarke panics about the ensuing duel, and tries to stall it every which way she can. She pleads with Lexa to pick someone else. “You’ve never seen me fight,” Lexa responds. Clarke won’t relent, though — she’s seen Roan kill and doesn’t believe Lexa can beat him. It’s a sneaky setup. In this future, people have moved past the myth that women can’t fight as well as men. Of course, we’re still watching the show in 2016, so there’s an inherently gendered subtext to this story line, regardless of intent. Clarke has serious doubts, so she approaches Roan and tells him that he should oust his mother. Doesn’t he want to be king? It’s a smart move. I love that Clarke is the kind of character who shows up in Polis, looks around, and immediately adjusts. She’s quick to understand other people’s motivations, and her instincts are spot-on — Roan encourages her to kill Queen Nia. Her plan is both brilliant and utterly unbelievable: She’ll pledge a fake blood oath to Nia, then backing her instead of Lexa. Even though Clarke has essentially been thrust into a new political system, she seems to show an innate understanding of how the Grounders operate (unlike many of the other Sky People), and uses this knowledge to earn their respect. Nia falls for the blood oath, but one of her guards stops her before she can slice her palm open. Clarke has poisoned the blade. Instead of killing Clarke for this betrayal, though, Nia cuts open her guard’s palm and drips the blood onto Clarke’s face. The girl is a Nightblood, eligible to become the next Commander. Clarke takes this information back to Lexa, again begging her to not fight. Lexa gently reminds Clarke that she can’t fix this. It’s a beautiful moment between the two of them, as the air is filled yet again with unspoken feelings: Clarke’s worried because she truly cares about Lexa, but neither character needs her to say it. The choreography of the fight scene between Lexa and Roan is incredible, and I have to admit I watched the scene three times just because it was so utterly badass. Let’s focus on two particular moments, both of which satirize traditional fight scenes while also showing that Lexa is as strong as she is smart. The first happens early, when Lexa is on her knees, blocking Roan’s sword with her own. It’s clear from his stance that he has the advantage … until Lexa grabs her own sword for leverage, even though the blade cuts into her palm. The second moment happens when she’s lying on the ground, ostensibly seconds away from death. Though she’s prostrate, she times her movements perfectly, and by waiting until the very last second to roll away, she finds an opening to kick Roan. Terrific details, right? Back at Arkadia, “Watch the Thrones” follows a somewhat parallel story line. Last week, I lamented that we didn’t actually get to see an election. In this episode, however, it appears the Sky People are still going to hold an election even though Abby already nominated Kane at the summit. Kane is initially uncontested on the ballot, but by end of the episode, he’s challenged by Pike. I’ve been waiting to see exactly when and how Charles Pike’s “all Grounders are bad” mentality would take over at camp — and now I think we’ve finally gotten there. I certainly wasn’t expecting Bellamy to join Pike, though. Bellamy feels personally responsible for the explosion at Mount Weather, and attempts to resign his post. Kane tells him that he did the best he could with the information he had, but Bellamy won’t listen. Later, Bellamy sits with Pike, who tells him that they’re both responsible for Mount Weather — and they’ll also both be responsible for anything that happens to the Sky People if they sit idly by, allowing Indra’s peacekeeping troops to stay where they are. Bellamy agrees to arm Pike and a few others. When the team tries to leave camp, they’re stopped by Lincoln, Monroe, and Harper. Though Bellamy is able to convince Monroe and Harper that he’s never led them astray, Lincoln doesn’t budge. Kane and Abby are able to stop Pike’s crew from leaving Arkadia, but the damage is done. 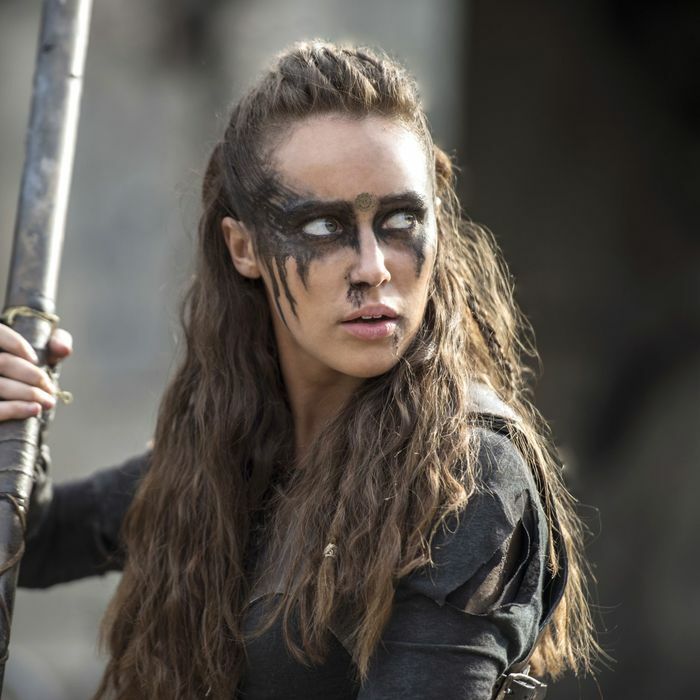 There’s a clear split now: Many of the Sky People have lost faith in an alliance with the Grounders. They nominate Pike as a last-minute addition to the ballot, and he wins. Within minutes, he starts changing things up — he won’t honor what went down at the summit. The Sky People are no longer the 13th Clan. The look on Octavia’s face when she realized Bellamy’s plan was heartbreaking. Last week, we got to see an exceptionally tender moment between the Blake siblings. This time around, though, it looks like the Blakes are on opposite sides of the fight against the Grounders. I’m really curious to know how Bellamy’s new position will affect Octavia’s choice to stay with the Sky People, a community that literally put her in prison for being born. The fact that Octavia is able to forgive and trust the Council is incredible to me, and I had credited most of that to Bellamy. He loves her so much; he even shot someone to come down to Earth with her. Indra and the Tree Crew, however, accepted Octavia after she spent time proving herself to them. For the second week in a row, The 100 lacks a City of Light story line, although the episode still follows a bro-pair on a quest. While the rest of Arkadia participates in a painful memorial for the 43 people lost at Mount Weather, Jasper grabs a backpack and heads to the scene of the crime. Monty follows him, watching as Jasper walks to Mount Weather and passes out. He searches through Jasper’s backpack and finds that Jasper brought Finn’s ashes with him. When he wakes up, the two of them have it out. Devon Bostick nails the raw, unadulterated grief that Jasper is feeling, particularly when he looks at Monty and asks him why he’s the only one that’s so tortured. Jasper understands why Bellamy and Clarke made the decision to kill everyone, but he can’t understand why Monty let them do it. Then, in a drunken stumble, he spills Finn’s ashes and ends up on the ground, sobbing. Sad Jasper is a loose cannon, and I’m incredibly nervous to see what will become of him. This being The 100, it’ll probably involve someone dying. We got to spend a little more time in Polis this week, and I want to take a moment to say that the city is really cool — especially on the street level. The 100 is great at taking places we know and tweaking them slightly, so that we can imagine each sight in this postapocalyptic world. Polis is the first actual metropolis we’ve seen, and the show’s creators do a marvelous job making it feel like an organic part of The 100’s world.